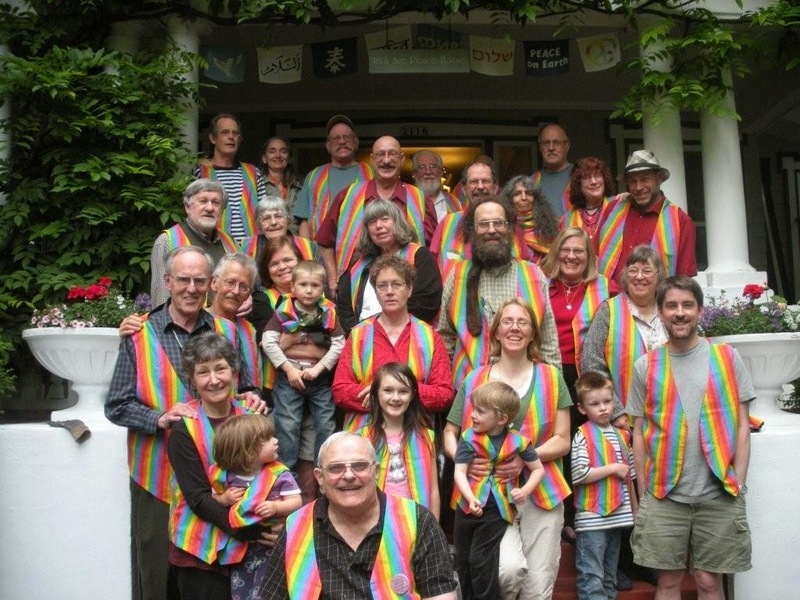 Metanoia Peace Community, 2011--a year before it disbanded, unable to continue without the leadership of its now-retired pastor, John Schwiebert. Big things happened to me in 2000. My second marriage was officially over December 30, 1999. My career as a United Methodist minister ended about two weeks later. The church I was serving as associate pastor and music minister had seen almost from day one that I was damaged goods, that I had suffered far too many defeats and humiliations, and that, at the very least, I needed a break from ministry. They had rolled the dice on me, creating a new position that matched my skill set, but I was only delivering on a portion of my job description. Seeing this, but wanting to honor their commitment to me, they worked out a deal with the conference office to place me on disability leave. The conference would pay the disability portion of my salary, while the church would continue to pay the remainder, as well as my housing, through June 30, with no expectations of me other than that I would stay away from the church. It was the clergy equivalent of the New York public school system's rubber room. It was a far more generous solution than I was able to see at the time. As much as it felt like I'd been pushed off a financial cliff, I was being given six months to figure out how to land. I began exploring my options immediately, looking into returning to school (always a safe, if utterly unaffordable, option), taking a temp job with the Census, and for the first time in nine years, attending a church because it was my choice, rather than my job. Picking the church was easy. Since 1985, I'd been intrigued by everything I heard about John and Pat Schwiebert, the couple at the center of the Metanoia Peace Community. I've written about this intentional community of peace activists and spiritual misfits many times in this space; search "Metanoia" on the index page of the blog, and you'll get at least two dozen entries. There were many things that drew me to the Sunday evening services--the commitment to pacifism, the dedication to welcoming sexual minorities, the profound compassion extended to people experiencing grief in any form, the neo-monastic lifestyle of the Peace House--but what mattered most to me at the time was that, even after fifteen years of studying and practicing homiletics, John Schwiebert's sermons challenged me as no other preacher ever had. Like me, he explored the hard passages, the uncomfortable moments in the Bible that make people squirm in the pews (or, in Metanoia's case, the couches and easy chairs of the Peace House living room), finding angles on them that were both intellectually sound and surprisingly innovative. Here was a man who, like my father, had sincerely wrestled with his faith and vocation for his entire life. And here was a community that welcomed people of any theological persuasion, including those questioning their identity as Christians. I never knew Metanoia to ask anyone to leave, but I did know people who decided on their own that Metanoia was no longer for them. In this place, the quest of the seeker was affirmed, even if that quest took one to a wholly other place. I knew two Buddhists who were members, one who left because she just could not deal with the "Jesus thing" anymore, the other who remained active until the community disbanded two years ago, finding its radical Christianity completely compatible with his Eastern spiritual path. I lived at the Peace House for three years, wrestling with whether I could be a Christian who was not actively employed by the faith. After just a few months, John found me a job playing piano at Church of the Good Shepherd, a small African-American congregation which embraced me and put me in the pulpit once a month. In some ways, this was a cheat--I was still being called "Reverend" and receiving a small salary--but really, I was easing myself away from the work, figuring out whether there was any place for me in ministry. After September 11, 2001, out of a sense of needing to be back and service, and having something to offer, I spent several months trying to come off disability and back into ministry, but the conference said no, not yet. That rejection led me to turn back to teaching, first as a substitute, then as a full time music teacher. In 2003, I moved out of the Peace House, settling in Sherwood, where my children lived with their mother. Two years later, she moved them to Idaho Falls. I could go on in great detail about how all these events impacted my faith, the ups and down of my church work, the ways in which I grew more and more disenchanted with even the Metanoia version of Christianity; and I have, in this space, talked about all those things. What I want to address now is where I have finally landed, and will probably remain for at least the remainder of this stage of my life: a category I used to deride, but which now see to be as descriptive as they come of my own spiritual state. I am spiritual, but not religious. I first encountered these words on Match.com and other dating web sites I used in the early 2000s to meet potential romantic interests. Most of those dates went nowhere, something I'm not going to explain here for reasons you'd thank me for if you knew what they were. What I saw on these web sites is that people of my generation and younger who live in the Pacific Northwest are unwilling both to claim denominational affiliations, and to acknowledge that their lack of such an affiliation makes them agnostic or atheist. There was and is no good word for this status other than the descriptive words "spiritual but not religious." Throughout my ministerial career, I scoffed at the idea that one could be spiritual apart from a religious community. I most often heard about it when I was brought in to perform a funeral for a man I'd never met, but whose wife had not missed a Sunday service in decades. Widow and children would say "The outdoors was his church," and I'd nod, even as, beneath the surface, I was rolling my metaphorical eyes. I believed very much that the spiritual life needs a community for nurture, that without such a community the spark will die and the faith vanish. And, in truth, that was one aspect of what had happened to me: without a community to nurture my own struggling beliefs, they had withered, especially during my four years in Yamhill County, serving rural churches on my own, with no one to hash out my theological struggles. Now I was out of the church, finding myself increasingly at odds with the religious institution I had devoted a significant portion of my life to serving. The only community that felt right to me was one that stood in opposition to Methodism's bureaucratic rejection of homosexuality and its co-opting by corporate and military interests, and even there, I had found myself turned off by even the most radically progressive interpretations of Christianity. To work within the faith, I was coming to believe, was itself to be co-opted by a global institution that was responsible for countless atrocities over the millennia. Christianity and I were through. But if I was no longer a Christian, then what was I? I still had a spiritual life. More and more, though, it was, like the spirituality of all those unchurched husbands of church ladies, centered outside the four cozy walls of church, chapel, and even Peace House. Canyon Creek Meadow, 2011: this time, with Amy by my side, I took time to stop and smell the wildflowers. I'd begun to realize this during a personal retreat in the fall of 1999, when I spent several days in the central Oregon Cascades, including a visit to Canyon Creek Meadow, one of my favorite places on earth. It's a gorgeous spot at the foot of Three Fingered Jack. The day I hiked there by myself, I spent half an hour seeing it through the viewfinder of my camera, seeking out picture after picture that could somehow capture its beauty. It was only on my way out, the meadow falling behind me, that I realized I'd only seen it through that tiny window, and had not once permitted myself to experience it with my own senses. I made a commitment to myself then to look, listen, and breathe the next time I was in a place of natural beauty, with the camera an accessory, rather than the entire point of whatever expedition had taken me there. In the fifteen years since then, I have pushed myself again and again to live out that promise, and it has paid off. I am more wholly at peace atop a mountain then anywhere else--though this is really only true if I've gotten there under my own power, whether that's on foot, on skis, or on a bicycle. I need some time to physically transition from the hell of the highway to the heaven of the summit. There were also marathons, though none since 2001, that chewed me up and spit me out, full-body cleanses that also broke down all the scar tissue of my psyche. Being outside, exerting myself, sweating, aching, sobbing with the effort of it, breathing as deeply as I ever had, absorbing the magnificence of my surroundings, I am closer to the ground of my being than in any edifice of stained glass and marble. That's where I've ended up. I still believe that connection to human beings is essential to spiritual well-being, and I continue to seek out community that helps me to become more fully human, but I have concluded that, at least for myself, such community must be independent of institutional structures and requirements. It's those requirements that turn any kind of faith into a religion: the hierarchy of leadership, the rules and regulations that keep the doors of its buildings open, its ministers in the pulpit, its parishioners part of the financial gravy train that pays for all those services. I understand that participation in religious communities is an essential part of the spirituality of billions of human beings, and I do not begrudge them that. I understand that, without institutional organization, most of those communities could not exist, and all those billions of people would be without the spiritual food they provide. But it's not for me, anymore than the book-worship of Christianity and the centuries of atrocities that have grown out of it. I speak its language--how could I not, after all those years of study and preaching?--but at the age of 53 (going on 54! ), I believe I have finally come home to what I am: an independent spirituality of human relationships and connection to the beauty of the world around me, which inspires me to compassion and service. Whether God is involved in any of this is unclear to me, and ultimately irrelevant to just being, and becoming, as fully human as I can with the time remaining to me.